Euro zone consumer prices fell at a record-equalling pace in January, more steeply than expected and supporting the backers of the European Central Bank's (ECB) money-printing plan to combat sustained deflation. The European statistics office said, in a first estimate yesterday, that prices in the 19 countries using the single currency in January were 0.6 per cent lower than a year earlier, after a 0.2 per cent decline in December. This was a sharper fall than 0.5 per cent decline forecast by economists in a Reuters poll. The euro zone has only endured negative inflation rates in one other period, from June to October 2009. The 0.6 per cent decline this month matched the lowest figure during that period, in July 2009. Sharply reduced fuel costs explained the drop. Energy prices plunged 8.9 per cent. Unprocessed food was 0.9 per cent cheaper, outweighing a 1 per cent rise in the cost of services. Oil prices have more than halved since June, with Brent at just below $50 per barrel yesterday. Core inflation, which excludes volatile energy and unprocessed food prices, dipped to a new euro-era low of 0.5 per cent in January from 0.7 per cent for the previous three months. Aline Schuiling, senior euro zone economist at ABN Amro, said she did not believe this marked the start of a negative trend in core inflation, with Thursday's German inflation figures influenced by one-offs such as the timing of sales and volatile prices of package holidays. Other economists said the impact of certain tax increases a year ago could have led to the euro zone core figure dropping. Headline inflation has also been in what the ECB calls the 'danger zone' below 1 per cent since October 2013. The ECB aims to keep inflation just under 2 per cent over the medium term and the risk of sustained deflation led it earlier this month to launch a 1.1 trillion euro quantitative easing programme of government-bond buying. The euro zone's central bank plans to purchase sovereign debt from March this year until September 2016 releasing 60 billion euros a month into the economy. 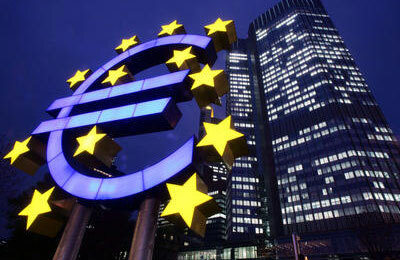 "It confirms the point of view of the doves that the ECB is on the right track. That's the basic message," said Commerzbank economist Bernd Weidensteiner, adding that if inflation remained low then pressure could mount for the ECB to increase its monthly bond purchases. "However, we think inflation is nearing its low point and from March will start to rise again if oil is stable," he said. Germany this month joined the countries with negative inflation rates this month. In Spain, consumer prices fell for a seventh consecutive month and at their fastest rate in the euro zone era.